One of the most important factors to consider in selecting a preschool for your child is whether the school offers the kind of preschool environment that will prepare your child for elementary school and beyond. A play-based preschool program is designed to do just that. Preschool children learn through meaningful play activities. The teaching staff guides them in the direction they need to go to learn academic and social skills for themselves. Play activities are often very engaging and open-ended to provide students with opportunities for self-accomplishment and self-discovery. Play-based programs take advantage of the highly engaging nature of children’s play and use it for a deeper exploration of the science and academic concepts underneath. Below are four of the top reasons why a play-based curriculum like that offered by Fairfax Christ Lutheran Preschool provides your child with a better learning environment and developmental advantages over an academic program. The preschool educational philosophy applied by Fairfax Christ Lutheran focuses on social development, and self-discovery. We believe children learn better through play in a safe and nurturing environment. 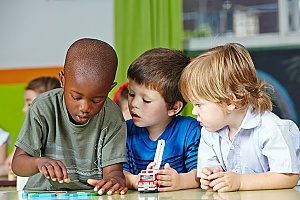 The play-based preschool philosophy is designed to enrich the whole child, including social, emotional, physical, cognitive, and creative development. Through a play-based program that attends to the whole child, we strive to foster a sense of community that will sustain and enrich the children throughout their lives. Other preschools may emphasize academics such as reading and math. Studies show that an emphasis on academic learning at the preschool level is too early for long-term effectiveness. Play-based learning is the most effective way to prepare a preschool child with the foundation necessary to succeed as the child grows. Our curriculum introduces basic academic skill using activity-based experiences. 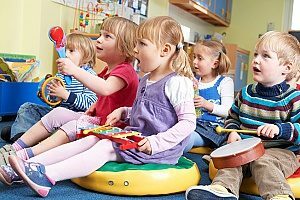 For example, the children will begin learning the alphabet and begin numbers and counting, as well as spend time with arts and music activities. Children who have attended Fairfax Christ Lutheran preschool are well grounded and prepared to move on. They are socially ready for kindergarten and better prepared to learn the academics once in elementary school. The elementary school staff wants the preschool to prepare the children socially and let the elementary school take the children forward academically. All curriculums at Fairfax Christ Lutheran Preschool are designed to help impart to the children the belief that each child can become a doer, a leader, and a nurturer. We believe that preschool is time to learn social and emotional skills so your child is well-equipped to move forward academically. It is well-known that play is an important element of learning in preschool age children. Ample research and evidence show that children learn and develop most effectively through play. Child development experts believe that play actually affects the structural design of the brain. In addition, security in relationships and brain stimulation are significant aspects of brain development. Play-based learning offers your child many opportunities for active and stimulating exploration which assists your child build strong brain pathways. Play helps your child develop a brain with increased potential for learning later in life. Instead of traditional academic preschool programs, a play-based program allows children to explore, identify, negotiate, take risks and create meaning for themselves. The cognitive benefits of playing are well-documented. It helps them develop sound memory and language skills, along with instilling good self-control. With a Christian play-based program, parents can easily participate in the classroom activities. The parent helper can provide assistance by helping organize and prepare craft supplies, helping the students wash hands, guiding the children during clean up time and other similar activities. By being in the classroom, the parents help to foster a healthy and nurturing environment that facilitates active participation by the children. At Fairfax Christ Lutheran Preschool, the teachers and staff believe in the success record of a Christian play-based preschool. We hope you will contact us to schedule a tour of our beautiful school grounds and meet their loving and caring teachers and staff members. They are happy to talk to you and can provide you with contact information of many satisfied parents of their students.